The Flat Rock Scorpion is one of the most fascinating and primitive scorpions in the world! The Flat Rock Scorpions Hadogenes spp. are intriguing novelties. These species, found only in Africa, are the longest, and possibly the heaviest species of scorpions in the world. Males can reach over over 8" (21 cm) while female typically reach between 6 to 7" (15-20 cm) or more. The heaviest specimens can weigh up to 32 grams and these are probably some of the longest lived scorpions. Flat Rock Scorpions come in many different color variations, dark or light color tones of browns, reds, and yellows to blacks, grays, greens and blues. Yet even more fascinating is their distinctive body shape. They are adapted to live in narrow cracks and crevices of rock piles. These scorpions have a wide, flat head and segmented body with big, flattened claws. They have stiff bristles over the body and a very long, spindly tail tipped with a small vesicle (sting). There are approximately eighteen Hadogenes species with several found in the pet trade. Probably the best known is the Giant Flat Rock Scorpion H. troglodytes. Others familiar species include the Olive Keeled Flat Rock Scorpion or Banded Flat Rock Scorpion H. paucidens and the Giant Banded Flat Rock Scorpion H. bicolor. South African Flat Rock Scorpions make an ideal pet for the beginner and advanced enthusiast alike. They almost never sting, though they may pinch. They live a long time, are hardy, and require very little maintenance. Hadogenes troglodytes zuluanus - Lawrence, 1937. Habitat: Distribution/BackgroundThe first of the Flat Rock Scorpions Hadogenes troglodytes was described by Peters in 1861. These scorpions are endemic to Africa, and are found across a wide range of southern Africa. 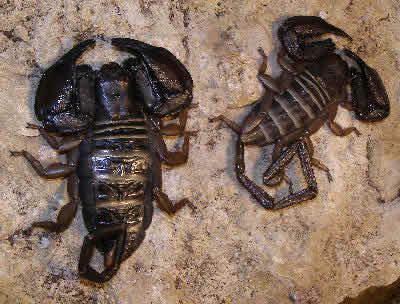 Other common names they are known by are South African Flat Rock Scorpions. This Flat Rock Scorpion is the best known of its species, and has the longest recorded body length of any scorpion. Olive Keeled Flat Rock Scorpion is distinguished by the yellowish edges on each segment (tergite) of its body, giving it a striped appearance. The Giant Banded Flat Rock Scorpion is bluish in color with yellowish colored chelicerae (mouth parts), legs and telson (middle lobe of the tail). StatusThe Hadogenes spp. are not on the IUCN Red List for Endangered Species. However one species, Hadogenes gracilis has a very restricted range in Mapumalanga and is possibly threatened with extinction because of mining destroying its habitat. DescriptionThe South African Flat Rock Scorpion is the longest and possibly the heaviest species of scorpion in the world, weighing up to 32 grams.. It has a strange, flattened segmented body (mesosoma), wide flattened head (prosoma), flattened claws (pedipalps), slender tail tipped with a small vesicle (sting), and stiff bristles over its body – all pointing to its lifestyle of living in the cracks and crevices of rock piles in its native Africa. The Flat Rock Scorpion is sexually dimorphic. Males are easily distinguished from females due to a longer tail. Males show extreme elongation of the metasomal segments of the tail. This helps in not only making them longer than the female, but also makes this one of the largest and longest species in the world. They often keep these tails coiled around and close to their bodies. Some males have been reported to reach over can reach over 8" (21 cm), while a female typically reaches between 6 - 7"+ (15-20 cm). There are many different color varieties ranging from browns, reds, and yellows to blacks, grays, greens and blues in either a dark or light color forms. They can be very long lived, having a lifespan of up to 30 years or more in captivity. Food and FeedingIn the wild, South African Flat Rock Scorpions feed almost exclusively on mollusks, but in captivity will switch fairly well to crickets and other insects including wax worms and mealworms. HousingThis South African species is considered a lithophilic, or rock-dwelling species. Its long legs and compact body, with stiff setae and strong claws, help it to scurry quickly over rocks and stones in its rocky home. In nature, it is commonly found under stones in scraped out areas in the substrate. They can be kept individually in a 5 to 10 gallon terrarium with a 3 - 4" (8 - 10 cm) sand/soil substrate. Provide some sort of a shelter for them, ideally flat rocks such as slate can be used. Alternatively a piece of wood such as sheet of cork bark or similar shelter can be used. Also include a shallow bowl of water. The Flat Rock Scorpions are agile climbers so be sure the enclosure has a secure covering, preferably of glass. The Flat Rock Scorpion is semi-aggressive. Though babies can be kept communally with the mother for several weeks, adults are best kept individually. Behavior The Flat Rock Scorpion is semi-aggressive. Though babies can be kept communally with the mother for several weeks, adults are best kept individually. Handling Flat Rock Scorpions seem somewhat reluctant to sting and like Emperor Scorpion, tend to use their strong claws to pinch as a defense. They don't seem to enjoy being handled and will try to escape by crawling off the hand using its strong legs and even pushing with its long tail. As with most invertebrate pets, keep handling (and thus stress) to a minimum. Reproduction Females Flat Rock Scorpions, though as large and robust in body as the males, have tails that are much shorter than those of the males. The male quickly grasps the pincers of the female and begins a shaking action known as "juddering". Then, after a short shoving match, the male deposits a spermatophore onto the substrate and positions the female over the packet of sperm. The female lowers her abdomen and picks up the spermatophore into her genital opening. The two separate and often beat a hasty retreat in opposite directions. A strange habit is noted in the reproduction of the Flat Rock Scorpion species H. troglodytes. This species, perhaps as a water conservation measure in its dry, arid habitat, does not produce a great deal of the moisture that is normally associated with the birth membranes of baby scorpions. Thus, the "ease" of birth is seemingly compromised and the birth of the twelve to eighteen small scorpions can take as long as ten days. Availability Currently, Flat Rock Scorpions are being imported in large numbers from Africa. Unfortunately, there have been very few captive breedings of this species. Hopefully as interest in scorpions grows, more and more specimens will be available as small, healthy captive-hatched scorpions. Hi I don't know anything about scorpions, this is the most info I've ever read on the rock scorpion. But, I have a problem. I do not want them as pets, but strangely they picked me? We have found two of them (in the last two months) in our home, even another specie as well, definitely poisonous, looking at the small claws and the fat tail - this one was yellow. All I want to know is - why do they come inside? What should I do to prevent this? I have small grandchildren, and I do not want them to be stung. Can anyone help me with any ideas? Pretty please? I would be concerned about scopions getting into the home. I would call an exterminator but I would try and find out how they are getting into the house. Is there a hole for example around a plumbing fixture. Check around the house for any entrances that they can be using and plug them up with that foam that hardens. They are not little spiders so hard to just sneak in so I would think an opening into the home. I was just going to add that sometimes, or when I lived in Texas anyway, they would come in from the outside when it was damp out. Humid day, rainy, etc. There are ways to help control it from happening. Give an exterminator a call and they should be able to give you some tips so that they might not have to come out. Good luck! Oh, and use the internet to your advantage...there is a wealth of info. I will see if I can find anything else out for you. This is an old remedy, but if you put cedAR chips around your home and in bedding it will deter arachnids. You can also spread rosemary and clove oil around doorframes, windows, etc. Ants and fleas hate it too. Use a small flat container, like a baby food jar lid. Cut a piece of sponge to fit in the lid and thenfill it with water. This way they can get a drink without drowning. You shouldnt have to give them any type of water. They will get all the moisture they need to get through their first instar, from the mother. As for offering water when they are away from mom, they will get all moisture from the food. If you really feel as though they need a drink (worried like me) you can spray a little bit of distilled water on the side of the deli tubs you should be keeping them in. But never more than once every 2 weeks. And make sure the water will evaporate with in 4 to 6 hours, so to reduce the risk of mycosis. You can go to http://scorpionforum.darkbb.com/forum or http://www.arachnoboards.com. Both places have alot of information. When I lived in oklahoma I actually had found a scorpion that looked like a flat rock scorpion but with dark red markings on its sides and it's weird I can't find any records of anything like it so I don't know strange. If you find any thing let me know it would definitely clear my mind.